Valor® essential oil blend is one of our most popular products and a favourite of founder D. Gary Young. Its woodsy, positive scent comes from a blend of Northern Lights Black Spruce, Blue Tansy, and Frankincense. Valor is great for massages, in addition to other topical and aromatic uses. Valor is renowned for its soothing, comforting and calming aroma and for its ability to promote emotional balance. Use it to greet each morning with a positive attitude or to unwind at the end of the day. Its powerful yet calming scent is versatile enough that you can integrate it into your morning and bedtime routines and anywhere in between. As one of our top-selling products, this in-demand oil is difficult to keep in stock. Because of its popularity, quantities are limited to two bottles per account per month. For an alternative, try Valor II™, a substitute personally created and recommended by Gary Young. Diffuse or inhale Valor using the tent method (rub 2-3 drops between palms, cup hands around nose and mouth) in the morning to jump-start a busy day with its uplifting, affirming scent. Wear as a subtle cologne or use as a base for personalised scents. Apply 2 drops to the heels of the feet before a workout to help stay motivated and energised. Combine with Frankincense to help boost confidence. Complementary essential oil blends include: Joy, Gathering, Sacred Mountain, and Clarity. Apply to wrists, chest, base of neck, feet, or over heart to help balance the spiritual, physical, mental and emotional energies of the body. Diffuse to promote courage, self-esteem, and strength. 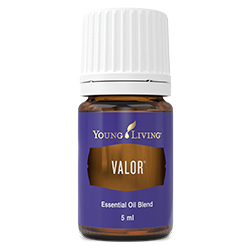 Valor can be substituted with Peace & Calming or Harmony essential oil blends. Worry can create an imbalance on all levels; Valor may help with creating balance and harmony within the mind, body and spirit. Combine with V-6™ Enhanced Vegetable Oil Complex and Use in a foot massage before bedtime to help promote restful sleep. Use to aid with staying focused and on-task. Use as a natural aftershave. Put 1-2 drops on your pillow before bed to help release worries and unwind. Caprylic/capric triglyceride, Black spruce (Picea mariana) leaf oil †, Camphor (Cinnamomum camphora) wood oil †, Blue tansy (Tanacetum annuum) flower oil †, Frankincense (Boswellia carterii) oil †, Geranium (Pelargonium graveolens) flower oil †.